Former Institute manager Kevin Deery has joined Sligo Rovers' back-room team. EX-Derry City captain Kevin Deery is already planning for the future with Sligo Rovers. Deery, who was appointed as Gerard Lyttle’s number two yesterday, wants to be at the Showgrounds for a long time but he knows that will only happen if the Bit O’Red advoid the drop. The 32-year-old is also looking forward to working alongside the ex-Cliftonville boss. 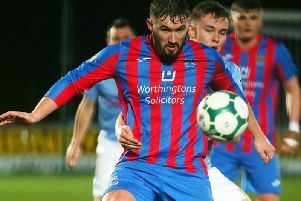 “I love challenges and I think after meeting Gerry, he a nice football man, who is looking to obviously secure our Premier Division status and then speak again on what way we can improve the club,” he stated. “I’m not going down to Sligo thinking that it’s only six weeks, I’m going there to try and have a real impact, show my worth to people and give my all to ensure that we stay up. “Speaking to Gerry, he’s very open to ideas and he went and watched ’Stute a lot of times when I was manager, he liked the way we played and I think, ultimately, that’s why he asked me to come down and assist him. I’ll do what’s best for the club. I want to go down there and have an impact, so whatever it takes to do well that’s what I’ll do. “He has the same beliefs as me, likes playing the game the right way, training the right way and is passionate about things and I think it will work well. “But you have to put the hours in and I intend to do that. Gerry is very hands-on and he doesn’t leave things to chance, so it’s going to be a real good experience for me. “It’s going to be really refreshing to see how another manager does things and you are never too old to learn things, you never stop learning and I’m really looking forward to it. I’ll stay overnight in Sligo the day before every game and every other day I’ll travel up and down, as it’s just a few hours from Derry. Deery conceded that the call to link up with Sligo came out of the blue, but he’s delighted to be joining such a great club. “To be honest I was in the house one night when I got a phone call from someone close to Sligo sounding me out to see if I would be interested and I obviously said ‘of course I’m interested’, because it’s a great club,” he said. Since hanging up his boots a number of years ago Deery believes the League of Ireland has changed, with young players getting more of a chance, which is something he believes in and with just six league games remaining he’s only worried about Rovers securing as many points as possible in the run-in rather than playing pretty football. “There’s no doubt from when I finished playing to now there has been a transition in the league and there’s a lot more younger players getting their chance, which is refreshing,” he stated. “If you look a most teams now there’s a lot of young talent who are getting an opportunity and that’s something I felt I did well at Institute, we had to build a youth structure and give young players a chance. “Apart from maybe the top two it’s a very open league and it’s hard to predict every week. “At the minute Dundalk look like the team, if they had have started well and Cork hadn’t won as many games at the start, it probably would be a lot closer. “I feel it’s a league now, where every side is capably of beating any team and that’s the way we have to view the next six games. “I was down at the Falkirk game and I seen them against Derry at Buncrana, when Derry overturned them comfortable enough, but against Falkirk they were the better team, deserved something out of the game and they were unlucky. “Speaking to Gerry he’s been very happy with the way training has been going and they realise the importance of digging in and getting the results now at the important stage of the season.